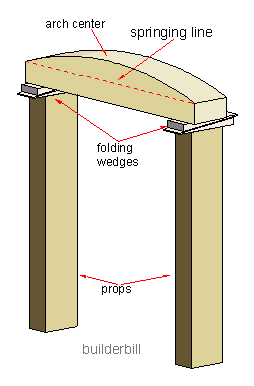 Temporary framework or formwork, usually timber that masonry or concrete arches are built on top of. In centering. The thin battens nailed to the ribs of the center that the masonry sits on. Above is a photo of a small segmental brick arch. Looking at the brickwork it is possible to tell that it is at least one full brick deep. 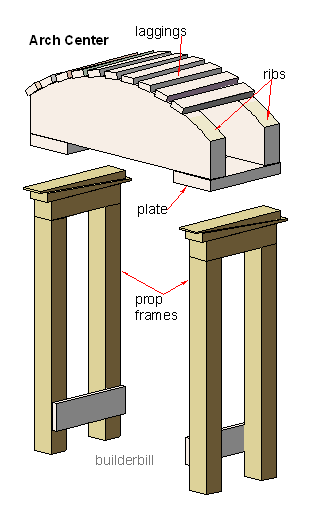 At the right is just about the simplest for of arch centre for this type of arch. This one would be for an arch in a single brick wall. Say 4 1/2" thick. As soon as the wall gets thicker than this, to save cutting large pieces of timber then the center gets made up out of more parts. Ribs, plates and lagging as shown below. At the same time the propping system is upgrade also because of the extra weight carried etc. The arch in the photo above does not have much rise so it could just about be built with a simple center like the one. However most arches require more complicated centers.